The appearance of mold in your home or building should be a cause for alarm because it can result in serious property damage and negatively impact your health. Mold can appear on your property at any time if the spores find the right conditions which include moisture and a food source. This is why mold is a common aftereffect of water damage. The food sources most commonly used by mold are organic materials found in wood and drywall which is why these materials can experience serious damage from mold growth. You must act to remove mold as soon as you find it to limit the damage to your property and reduce the risk of negative health effects. 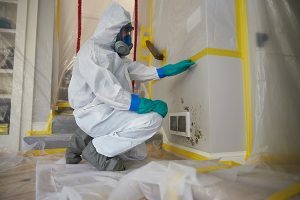 ServiceMaster by Alpha Restoration provides mold remediation services in Coral Gables, FL that include mold testing and the repair or removal of affected materials. Our technicians are properly trained and equipped to deal with any case of mold growth, and we use the highly accurate InstaScope testing system to make sure we find and remove all mold growth on your property. If mold growth is not removed right away, it can eventually cause serious damage to the materials it is growing on and trigger adverse health effects. As mentioned above, mold feeds on organic materials found in wood and drywall so it is literally devouring the affected surfaces. These surfaces will become discolored at first but can eventually sustain structural damage as the mold continues to eat away at the material. The mold is also a major threat to spread as mold colonies release spores into the air. These spores can settle in a new area of your home and cause mold to grow. The negative health effects that mold can cause is another reason to react right away when you find mold. Those who are exposed to mold spores may experience skin irritation, coughing, nasal congestion, itchy eyes and throat, and other similar allergic reactions. If someone is exposed to mold for too long, they may develop much worse symptoms such as a respiratory infection. Any amount of mold growth on your property is dangerous, especially if it is growing in a hidden area like behind walls and ceilings. Mold growth in these areas can lead to very serious damage before it becomes apparent. Our technicians will test for and uncover all mold growth on your property using the highly accurate InstaScope testing system. We will then form a mold remediation plan once we have uncovered the full extent of the mold growth. After we finish the mold remediation, we will retest your property to make sure that your home or building is mold free. If there is mold anywhere on your property, you need to act fast and call a professional to assess the extent of the problem and remove the mold. Our technicians at ServiceMaster by Alpha Restoration can accurately test for mold growth with the InstaScope testing system and ensure that all mold growth is removed. You can reach us at (305) 707-6135 for mold remediation in Coral Gables, FL.